PFSense 2.0 – Limiting users Upload and Download Speeds by Limiting Bandwidth. PFSense is by far one of the best gateway solutions out there in my opinion. I am going to show you one of the many reasons why I think this product is best of breed and that is the Bandwidth limiter. PFSense uses Free BSD as it base, it has included the DummyNet software project which allows you to simulate/enforce queues and bandwidth limitations, delays, packet losses, and multipath effects, it also implements a variant of Weighted Fair Queueing called WF2Q+. Now that may sound like a lot of reading to get up to speed with but I assure you it is quite easy to set up and maintain, let me show you how. First off I will take a bandwidth test to see what I get as unregulated bandwidth. 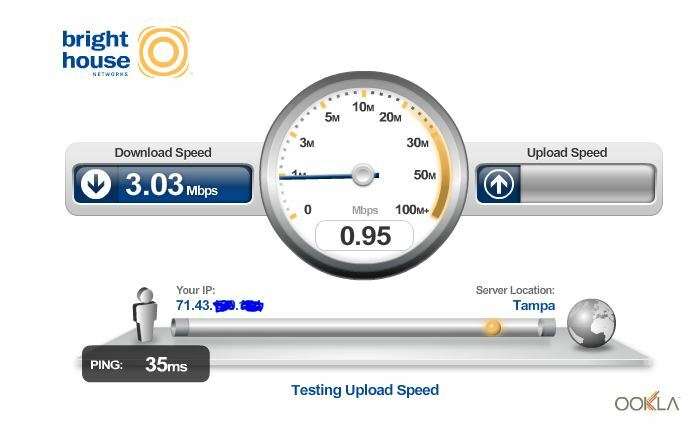 I have a cable service from Brighthouse that is 50Mb download and 5 Mb upload. 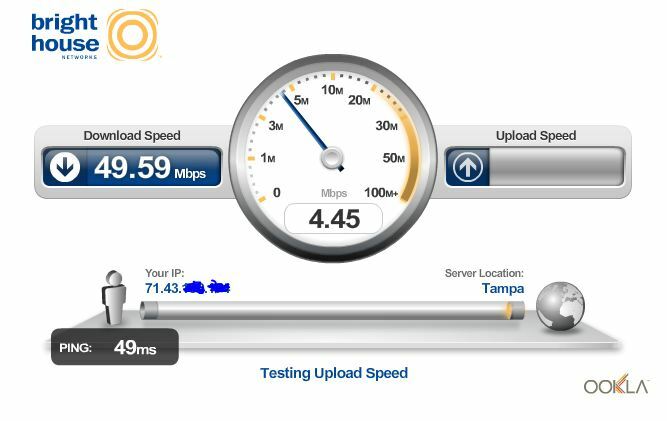 The image tells the tale, I am getting 50/5 as and result of my speed test using Brighthouse’s Speed test. Now let’s get started with our limiting, we will need to create a Upload and a Download limit we want to apply to each system on the LAN then create one Firewall rule to force the systems on the LAN to follow the limits. First we need to find our Limiter Web GUI area in PFSense. This is located under the Firewall Tab -> Traffic Shaper, the 3rd tab is called Limiter. Now we should have 2 Limiters available to us when we go to make the Firewall rule. We set in the limiters to mask the source address. This tells PFSense to create a unique queue for each Source address on the LAN side. If we left this set to none then we would have just 1 queue limited to 3Mb for all users on the LAN thus taking a 50Mb service and making it a 3Mb service. That is not what we want here, we want to limit each user to 3 MB each so no one person can abuse our 50 Mb service. We could have 10 users all streaming 3Mb each for a total of 30 Mb of download per second and giving us 20 Mb still available. Now lets start limiting our LAN systems. We need to make this rule above any allow rule that allows TCP and/or UDP. If we place it below an allow rule then that rule will take precedence over the rule we want to force our limits on. In this example I have placed rule on my LAN tab as rule #2 above the bottom rule which allows all my traffic out. Select the Advance button under the In/Out feature, from the drop down menus select the 2 queues you created (In = Uploads) and (Out = Download). Save and apply the firewall rule and re-test your bandwidth usage. That’s the whole process from start to finish. At this point you should have a rate limit of 3mb per LAN user downstream and 1 MB per LAN user upstream. That is part of the power built-in to PFSense and the BSD platform. Now go off and limit someone today! Nice write-up on the traffic limiter! I’ve been thinking about setting up a bandwidth limitation for my torrent box, mostly so it doesn’t saturate all of my upstream bandwidth. We’ve just started using this software to portion out bandwidth for all our users at our Business Park. Problem is, users inside the LAN get limited fine, however if you commence an upload from outside – example access a site CCTV camera or connect to an onsite VPN and upload to yourself – you get the full bandwidth of the connection. I am still searching for a solution to this. I am actually wondering if using this traffic shaping will raise the latency inside the LAN. I run an internet cafe, these gamers are militant little so and so’s 🙂 I have FTTN service 25/8 … 22 stations. I want it so that no one station will pull more than 2mb and push more than 800kb …Right now updates can and do pull all the bandwidth raising the otherwise stellar latency to 60 or 70 ms. Thank you a lot, it was ver usefull for me. I’m working in a school, trying to limit bandwith data comes from our Wifi accespoint. Using the same way you describe it works, just by replacing in the firewall rule: source -> single host and enter IP of AP. Hi Julien, does limiting the bandwidth of the WiFi AP distributes the bandwidth evenly? what i mean is, if you limit it to 2Mbps, then 2 users using it at the same time will share that 2Mbps, like 1Mbps per user? or both of them will have 2Mbps limit? Each IP address on LAN get 2mb up or down based on in/out rule. Doesn’t setting any destination also limits local LAN traffic speeds too? I’d like to limit ISP bandwidth to specific users on my home LAN, but I don’t want to limit local traffic in any way, as they’ll be using a fileserver too. How can i share bandwidth among users equally so that if i have 4mb/1mb with 4 users, each will have 1mb/256kbps. If i have 2 users, each will have 2mb/512kbps. I guess that if i limit bandwidth according to this guide, say limiting each user to 1mb/256kbps, then even if i have only one user on the internet, the user will not be able to utilize the whole bandwidth rather will be limited to 1mb/256kbps. Sounds like you need more advanced queuing. That is outside of this scope which is bandwidth limiters. 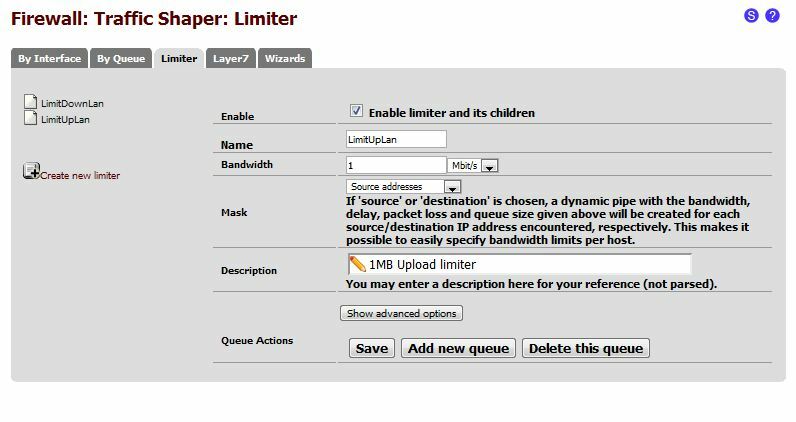 Since you asked I will put together a basic Quality of Service How-to using PFSense that describes how to use queues and percentages to control the amount of bandwidth people and or services can use. 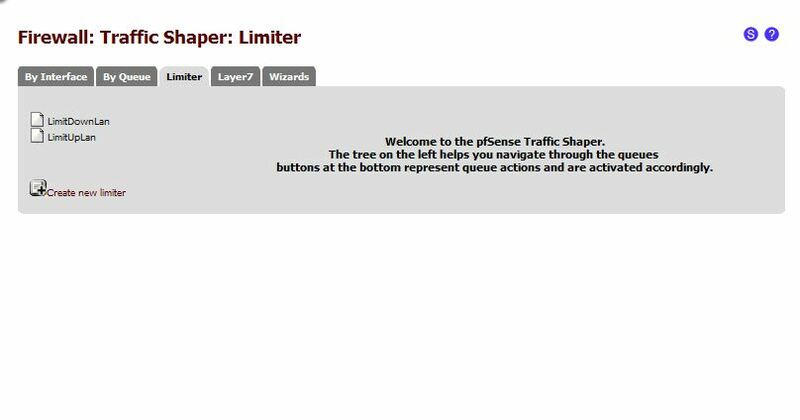 One of the nice things about using queues to manage traffic is that if the traffic is low then queuing does not happen. 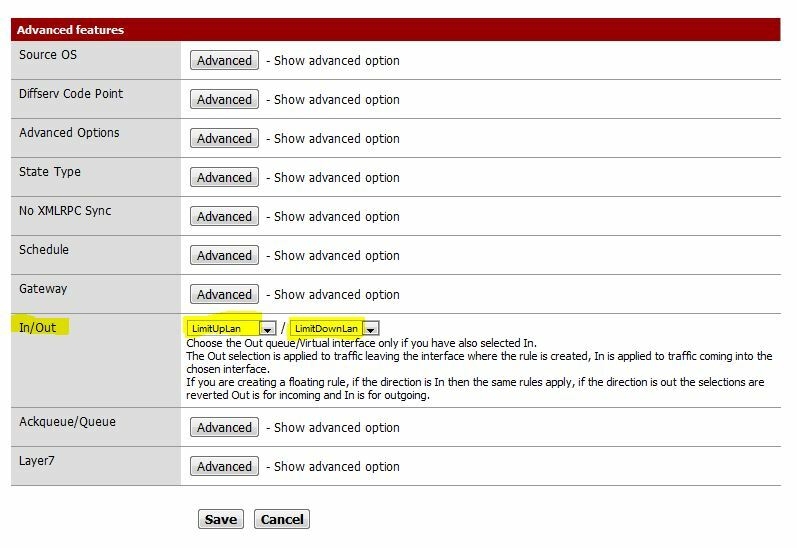 When using PFSense Traffic control queue the queues do not kick in until there is an actual shortage of bandwidth. When this shortage is seen the queues kick in and start to control how much bandwidth a user or service can use and how. The process is different from the common limiter you see described here. The limiter here is not discriminate on who it limits, all IP addresses are limited to the same amount of bandwidth and if you have 10 IP addresses trying to access a 5MB line and a limit of 2MB for each IP, you will still saturate you ISP service and have users that can not reach their limits. 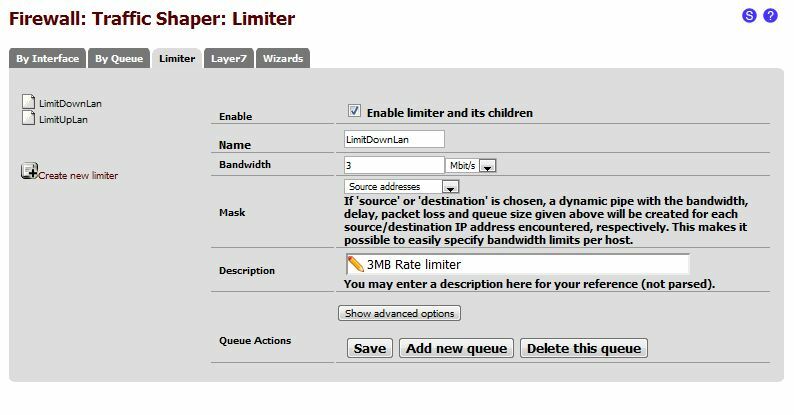 Queuing can allow users of one services to exceed bandwidth limits while other users of other services get squashed. Come back shortly and I will have an article up that walks you through the process. Bandwidth limiters on PFSense only effect traffic traveling from the LAN to the WAN interface. It does not effect LAN traffic staying on LAN. Hi, nice tutorial. I would like to ask if its possible to apply this limiter but not affecting cached objects from squid? And how? 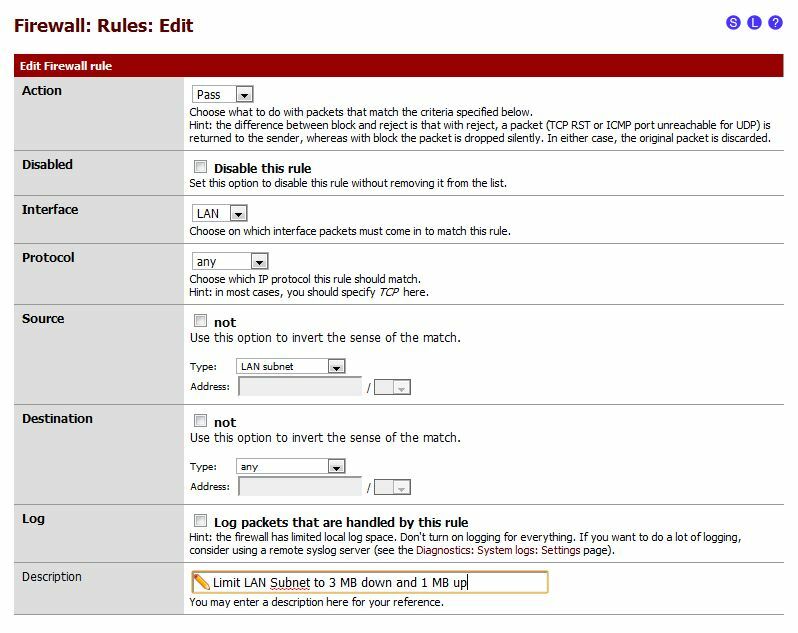 Well if you are running squid on pfsense, you could set a rule above the limit rules that all traffic from pfsense to ignore limiter or if squid is an internal system add an allow rule for its IP address above the limit rule. This will cause the proxy to bypass limiter. I hope I understood your question correctly. I’ve been trying to do that before, but your answer gives me an idea. Will try it here. thanks! 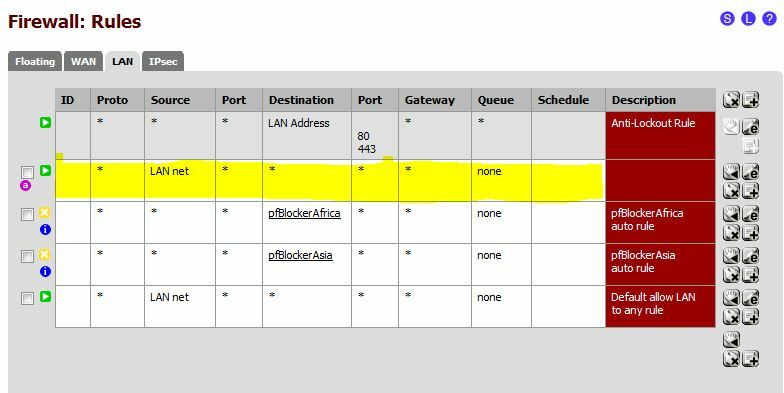 Hi Cubert, squid is on pfsense as a package not on a separate machine, what IP address as a source should I put in the allow rule? I tried putting the loopback address as that is what I can see in the firewall states. But it’s not working. Try anything to or from LAN interface IP address. See if that give you proxy speeds above limiter. I did all those steps above a limiter rule in the LAN interface tab resetting the firewall state each time I made the changes. Should I try in the Floating tab? Im on a testing environment with pfsense on a vm and an xp client also on vm. Caching is working well. The limiter is also working well. I’m having fun testing these and trying to achieve something but it’s not just working. Any ideas? thanks! Great guide…. Did you ever make your more advanced guide on “how to use queues and percentages to control the amount of bandwidth people and or services can use.” I too am interested in dividing bandwidth evenly between all connected users, but only limiting them when there is contention for bandwidth. Help with limiting torrent users please! The described setup establishes a fixed limited bandwidth per user. My related question is how to set up a prioritized but not fixed bandwidth distribution (both up and down) based on local IP address. Traffic types are not relevant for prioritization. Computers 1& 2 have equal highest priority for ALL traffic if they are active. Computers 3 & 4 have next highest equal priority. Computers 5, 6, 7 & 8 have equal lowest priority. Assume 10 Mbit service. Computers 1 & 2 equally share 5 Mbit/s when they require it, leaving 5 Mbit/s for all other machines. Similarly, computers 3 & 4 equally share 50 % of the leftover 2.5 Mbit/s when they require it, leaving 2.5 Mbit/s to be equally shared amoung computers 5, 6, 7 & 8. Addendum to my comment above: I didn’t state it clearly but the intention is if higher priority machines don’t need the available bandwidth, lower priority machines will make use of it in their assigned priority level. how do i whitelist certain IPs from this limiter? i have a half dozen IPs which need to be limited to 1.1mbit/112kbit and another 2 IPs which need to have no limits. im on a 16/1 adsl2+ connection with no datacap. Mati, you want a full CBQ setup then. That’s a whole different bear and not a process of limiting any or all users. Ins a CBQ queue by default all bandwidth is available to anyone until contention is met. Then queuing takes over and prioritizes the traffic. Thank you for your reply. So it sounds like no canned solution is available. I am new to all this. Could you suggest where I should start reading? Also, what does CBQ stand for? The LimitDownLan mask needs to be set to destination not source. You are affectively limiting each unique source connection with source being set. Which in your testing would appear fine. But this is why people are saying it is not limiting torrent downloads and such, because that is more than one connection from a local computer. If you set that limter to destination that would resolve it, limiting all download connections on each computer to 3Mb. Thanks for finally talking about >PFSense 2.0 – Limiting users Upload and Download Speeds by Limiting Bandwidth. | Squid Works <Loved it! If multiple people download from the same source website they will share the limit. Probably not what you want. Great article. worth more than a ton. Great write up, can same be achieved if I make an alias and add multiple users so each user will be limited or the whole alias will be limited ?? In your example, you create a LAN rule above all others on which to apply the limits. Except for the rate limits, this rule would appear identical to the very last rule you have, which allows access to everything. This rule is above two rules which I am guessing by their descriptions block connections to Africa and Asia. By placing it above these two “blocking” rules, would it not override the “blocking” rules and make them ineffective? How can i limit per User Upload/Download speed along with Captive portal ?? I tried and it did limit …. problem was I have to have the testing web page already open …. once it is done cannot open testing web page or cnn or msn…. I was able to open yahoo.com. If I create a rule above the limiting rule allow my computer or stop the rule every thing is ok …. if the speed testing web page was already open speed is limited. Problem on the webpage said timed out …. i have a question that we have a connection 7/1. the problem is that its data capped. after using the data allowance which is 70gb it will be 2.1 mbps max. i m using pfsense with limiter but sometimes cannot change the limiters on time, so, is there any other option like percentage in limiters so automatically it will reduce the bandwidth as it reaches to 2.1mbps automatically the limiters will reduce. Finally !! After many tries, this tutorial ist the first working one on traffic shaping for me. A lot of thanks to the autor ! !